Your OHV registration fees go directly back into the sport. Of the $20.50 collected from each registration, $13.50 is dedicated to the improvement of summer and winter OHV opportunities. $2 from each registration is used for safety and responsible riding education; $2 goes to the Division of Motor Vehicles to cover administrative costs, $1.50 goes to school trust lands, $1 goes to electronic transaction fees, and $.50 goes to fund search and rescue efforts. All OHVs must display a current OHV registration sticker when operated or transported on public lands or roads. Off-highway motorcycles may be registered as street legal if they are safety inspected and insured. OHV registrations expire annually on the last day of the month the OHV was purchased. Youth, 8-15 years of age, must take the Utah Know Before You Go! certification course before operating an OHV on public land. This OHV course lets you get your Utah off-road vehicle safety education certificate online so that you can comply with Utah education law. For more information go to the Utah State Parks website. 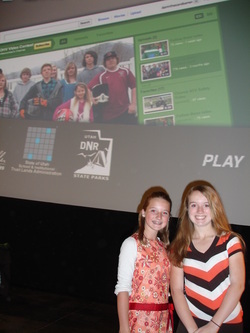 Salt Lake City -- Future videographers and filmmakers were honored for their 90-second RideOn! videos, which encourage OHV safety and stewardship of School and Institutional Trust Lands. This second annual RideOn! Video Contest was co-sponsored by the Larry H. Miller Group, Utah School and Institutional Trust Lands, and Utah State Parks and Recreation. These students won $500, plus $500 for their teacher and $500 for their school. The contest benefits all Utah schools, because interest generated from good management of SITLA land is distributed to every public school in the state. Local school community councils allocate the money to the school’s most critical needs, explained Kevin Carter, director of School and Institutional Trust Lands. Fred Hayes, director of Utah State Parks and Recreation, said safety is the agency’s priority, and reports nearly 50,000 young people have taken OHV safety classes over the years.